In this chapter one studies some properties of solutions of various variational inequalities of the first and second kind. We first consider a class of variational inequalities of the first kind and we emphasize a property of solutions, namely a maximum principle. We illustrate it by a problem which models the flow of fluids through a porous medium and an obstacle problem. Next, using the method of the translation, local and global regularity results of solutions of a class of variational inequalities of the second kind are derived. 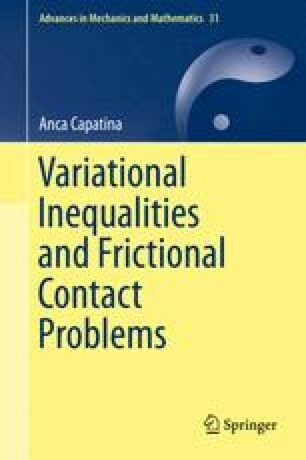 In the last part of this book, these results will be applied to a frictional contact problem.